At 5:30am on June 27, my alarm went off. It was baby day (at least I really hoped everything would happen in the same day). I showered, did my hair, got dressed and kissed Landon goodbye. The drive to the hospital felt so surreal. I had imagined frantically driving through the neighborhood racing to the hospital, but our morning was slow and relaxed. We arrived at the hospital where I was welcomed by my nurse. As we got settled into our room, I mentioned I wanted a natural birth (after the pitocin) and was going to do Hypnobabies as my pain management. I was a little embarrassed to tell her I was doing it because it's sort of out there, but she was so excited. She said she was game for anything, but I couldn't push on the floor - she didn't want to have to catch a baby on the floor. We instantly knew we were going to love her. I even asked her when the shift change was because I needed her to be my nurse the whole time. About 9:30am they started my pitocin and my doctor came in to break my water. I remember nervously saying, "Well, there's no turning back now!" I was worried that I was going to go into instant labor because after my water broke with Landon, I was pushing him out a few minutes later. When nothing happened, I was a little bummed but also relieved. Trip took pictures (per my request) and I watched Southern Charm on my phone. Towards the end of the episode, my nurse asked me what my pain level was. When I told her no pain, she said "I'm not doing my job then!" and turned the pitocin up. Every time I heard her turn up the pitocin, I got a little nervous. I finally started to feel something, but it wasn't much. The next time my nurse came in to check on us, I told her she could turn it up more and she said no. My contractions, while not painful, where happening every 3-4 minutes. I laughed and said, "Okay, but I can take it." Famous last words. At this point, we were a few hours in and Trip and I were bored. I asked to sit on the birthing ball (a yoga ball) to see if I could work Rhett down. My nurse bumped up my pitcoin a little more and it didn't take long before I needed to stop talking and breath through the contractions. Within a few more minutes I went from joking with Trip about our nurse's face if we set up a kiddie pool in the room to telling him "Goodbye, I'm checking out." I put in my headphones and started listening to the Hypnobabies track "Your birthing time begins." My doctor came in to check on me. I heard her telling Trip she would check me after her C-section was over. After about 45 minutes of my contractions getting more intense, and moving into my lower back, I got in bed for them to check me. I was at 5.5 cm. I don't remember being disappointed because I knew I went fast after 6cm with Landon, but I also remember thinking that I was only half way there. One thing that was sort of funny this time around was that I kept having to go to the bathroom. I would tell Trip that I needed to go, we would wait for the next contraction to pass and then he would unhook all of my cords as fast as he could so I could potty. I kept getting stuck in the bathroom with a contraction. Afterwards my nurse told me she told Trip I couldn't go in there anymore because she was worried Rhett was going to be born in the bathroom! I got back on the ball and rocked back and forth through some pretty intense contractions while Trip pushed on my lower back. He asked the nurse to check me again even though it had been less than 30 minutes since my last check. I was already at an 8. They wouldn't let me out of the bed this time because my doctor was getting nervous about Rhett's heart rate. My blood pressure also started to rise so they had me constantly changing positions. This part was super annoying to me because I just wanted to be left alone and I really wanted to get out of that bed! I guess I should explain that with Hypnobabies, the point is to be super relaxed. I describe it as "checking out." It almost felt like I was in a light sleep or super groggy - I could hear everything going on, but I didn't want to respond. Most of what happened after 6cm I was told later because I was so focused on breathing and staying relaxed through the contractions that I didn't even realize what was happening in the room. The nurse mentioned to Trip that my doctor was getting nervous about the baby and since my groans had changed she wanted to check me again. I think my nurse was worried that my doctor was going to start pushing a C-section. She checked me and said I was at a 9. My doctor came in and I remember her telling me I could start bearing down if I wanted to. I remember thinking "Good because I already am" and "How am I already pushing?" What seemed like a minute later, my legs were being put up and I was told to start pushing as I wanted. Eight minutes and three pushes later my doctor said, "Open your eyes, Ashleigh!" and my baby was being lifted to my chest. I just laid there and sobbed. The pregnancy with so many scares was finally over and he was here! The day before, my ultrasound tech estimated Rhett weighed about 5 pounds, 12 ounces. We were all shocked when that is what he weighed at birth. While doing his measurements, they determined he was "small for gestational age" which meant that we had to do blood sugar checks before every feed. Luckily, his levels stayed up and it ended up not being a big deal. He was a tiny, but healthy little guy. 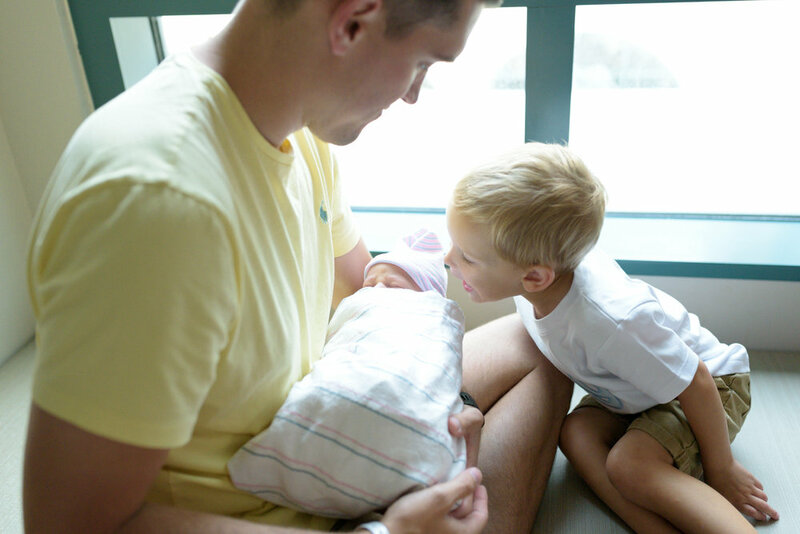 The next day Landon came to the hospital to meet his brother. As soon as he walked in the room, he asked where the baby was and said he wanted to give him a hug. Before Rhett was born, we talked about throwing him a birthday party. We even went to the store to pick out a present and Landon wrapped it all by himself. I was so happy Landon remembered and was excited for it. You can see the present in his hand and my mom said he picked out all the balloons by himself (notice the one polka dot one). Landon was born in Washington so we didn't have family in town. It was a treat for the Grandparents to start heading our way the morning of my induction so they could meet Rhett the same day he was born. And the poor baby wasn't going to escape without some First 48 pictures. I am so thankful I was feeling great after delivery and was able to take these.